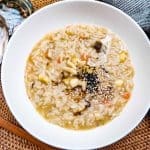 Delicious Korean Porridge made with Abalone! Soak rice in cold water for 30 minutes. We want to hydrate the rice before cooking. Use a spoon and pop out the abalone from its shell. Then, carefully cut away the liver (green section) from the main body. Also remember to cut out the mouth piece from the body (reference vide0). Wash the abalone. Then cut into thin bite-sized pieces. After 30 minutes, drain the rice. Give one final rinse under running water. Set aside. Take out a pot. Place on medium-high heat. Put in Sesame Oil (1T). Once oil is hot, place onion pieces in. Stir-fry until onions turn translucent. Then add in carrots, mushrooms and the abalone pieces. Stir-around for 1 minute. Then add in the blended liver mixture. Immediately, add in the water (6 cups). Then add in the soaked rice (1.5 cups). Add in Soup Soy Sauce (2 Tablespoons). Put lid on and bring up to boil. Then reduce heat to a medium heat. Set timer for 20 minutes. Occasionally, lift lid and stir rice around. After 20 minutes, check on your rice. It should have an oatmeal like consistency. If its runny, let it reduce for another 5-10 minutes. Finally, add in salt (1/2 Tablespoon). Turn off heat and scoop into individual bowls. Garnish with a small drizzle of Soup Soy Sauce, Sesame Oil and Sesame Seeds. You can also make with cooked rice -> Use 1.5 cups of cooked rice and 3 cups of water. Make sure to garnish with soup soy sauce, sesame oil and sesames seeds before serving.